This is another enterprising album in Sterling's Swedish Romantic series. All four works are receiving their world première recordings. Albert Rubenson belonged to an artistic and well-connected Jewish family in Stockholm. He studied in Leipzig - violin, harmony and counterpoint; and composition with Niels W. Gade. 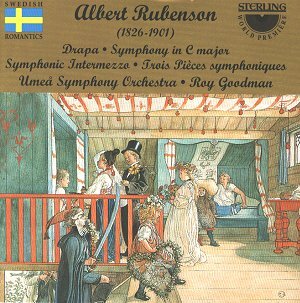 When he returned to Stockholm in 1850, Rubenson became a viola player with Hovkapellet (opera orchestra) before devoting himself to composition. He also served as a music critic on the Swedish New Musical Journal and was appointed Inspector of the Stockholm Conservatory of Music in 1872. In this post he became a fastidious civil servant whose musical opinions were conservative in the extreme, a marked turn-about from his more liberal ideas of earlier years when he had championed modern music. He preferred to compose for orchestra although the demand was for smaller scale works and songs. Drapa (Ode), the short overture that begins the programme, was composed in 1866. Drapa is the term for an ancient Icelandic poem of praise. The work is rather ceremonial in nature and speaks of chivalry and heroism but with an occasional melancholic tinge. Pleasant melodies are scattered throughout all four of these works but none of them are particularly memorable. The Symphony in C major was written in 1847 when Rubenson was a student in Leipzig. It is an interesting work, for a 21 year-old, with some novel attributes. It is full of youthful enthusiasm. The influence of Schumann and Mendelssohn is very apparent. The first movement is lively with a distinct spring in its step; the interest lies in a rhythmic diversity that the booklet aptly describes as often capricious. The movement is also rich in unusual modulations. The second movement is unconventional too: Alegretto moderato- Allegro- Tempo primo- Allegro-Lento-Tempo primo. The breezy Allegro is enlivened by refreshingly displaced accents. The slow movement is lyrical and slightly melancholic. An extraordinary trumpet call announces the start of the finale which is rousing and jubilant with a pastoral quality too. In the Symphonic Intermezzo (composed 1860; first performed 1868), Rubenson develops his use of folk-song material. The first movement feels somewhat Brahmsian and it mixes the homely with the heroic/dramatic. The second movement has a rather hymn-like solemnity before this mood is rudely interrupted by boisterous, catchy folk-song material. The final movement is energetic with vital rhythms and syncopations. For me, the most attractive and entertaining work on the disc is the Trois Pièces Symphoniques (1871). This is really light music; a delightful mix of folk and salon music. The first movement, marked Allegretto quasi Allegro might be rather stilted but it is an appealing confection. I was reminded of Eric Coates and the salon music of Elgar. The Vivace is a quick and spirited scherzo - very brief at just over two minutes duration; and the concluding Allegro ma non troppo ends on a more serious and introspective note. Roy Goodman and his Umeå players deliver spirited and committed performances. As an aside I was struck by the booklet's front cover picture (reproduced above). It has such a disturbing and haunting quality. The note inside gives only its title in Swedish with no indiction about what it depicts.